Set for Thursday through Sunday, July 26-29, 2007 in Grand Lake Colorado. The KAW Pasture will be at the Blue Bird Motel 970-627-9314 begin_of_the_skype_highlighting 970-627-9314 end_of_the_skype_highlighting. Cheap (for the area), mediocre lodging, but motorcycle friendly and they have a coffee hut for a hang-out. Plus there is some tent space available behind (you'll need a cot, the ground is pretty bumpy) and one space for full RV hook-up. The Blue Bird is a good location with easy access to HWY 34. Two doors west of Blue Bird is the Black Bear Lodge 970-627-3654 begin_of_the_skype_highlighting 970-627-3654 end_of_the_skype_highlighting which has some kitchen and family units available. Also note indoor and outdoor HOT TUBS and Saunas! Directly behind Blue Bird is the Lake View Bed & Breakfast 970-627-1200 begin_of_the_skype_highlighting 970-627-1200 end_of_the_skype_highlighting. There are lots of hotels in the area, the recoomendation is to stay out of Grand Lake proper because of traffic and clueless people backing into the roadways. It CAN be chilly early mornings and evenings in the high country. Expect night time lows in the 40s and daytime temps in the mid 70s. Most national parks have entry fees including one of the oldest National Parks in the nation Rocky Mountain Nat'l Park. Consider getting a National Parks Pass, they're $50 and allow you and your spouse/family entry into any National Park. Buy one now and you'll be all set when you get here. Some of the other parks included are Arches, Canyonlands, Pipe Spring Monument, Cedar Breaks, Hovenweep, Natural Bridges, Dinosaur, Great Basin and many many more in across the US. To order a Pass online click here. You can also order by phone at 1-888-GO PARKS begin_of_the_skype_highlighting 1-888-GO PARKS end_of_the_skype_highlighting (mailing fee of $3.95). When ordering by phone there is a $2 discount for AAA members or a $5 discount for AARP members. You can purchase a NPP at a Park Entrance for $80, but bring cash most are not set up for credit cards or checks. If you are 62 (or older), you can buy a Golden Age Lifetime Pass for a one time fee of $10. But these can only be purchased at a Park Entrance with a valid Driver's license as proof of age. Q. My spouse and I are each riding our own motorcycle, will one NPP cover both our entries? A. Yes. Except at those parks that have a separate motorcycle fee, the pass admits the pass holder, spouse, parents, and children. At parks with a separate motorcycle fee, the pass allows the pass holder and any additional rider(s) on the same motorcycle. Both Zion and Grand Canyon North have a $10 motorcycle fee. If you do not see your name here EMail me I'll update it as time permits. Thanx to Craig S. for our Potential Pin Design!! If your travels take to East instead of West, consider stopping by Heaven on Earth for Riders, The Kickstand Lodge. 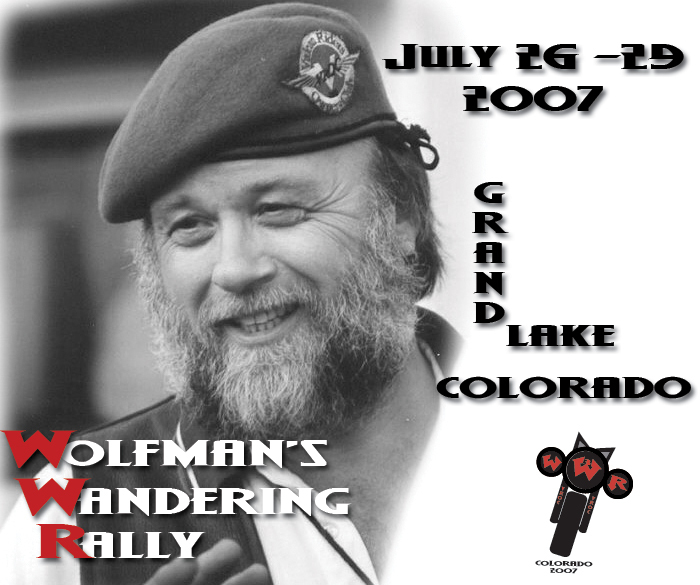 Only 6 years and -877 days since Wolfman's Wandering Rally!